This volume examines the contributions of proteins to the technological and organoleptic characteristics of food. 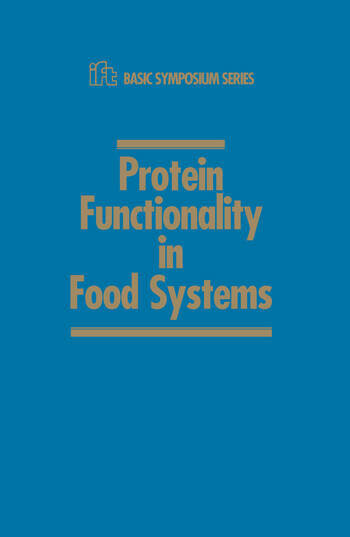 It provides a solid basis for understanding the principles of food protein functionality and offers information to help develop unique food products using proteins as novel ingredients. Properties such as solubility, viscosity, gelation, emulsification and loam formation are discussed. Structure-Function Relationship of Food Proteins; Solubility of Proteins - Protein-Salt-Water Interactions; Protein Separation and Analysis of Certain Skeletal Muscle Proteins - Principles and Techniques; Computer-Aided Techniques for Quantitative Structure Activity Relationships Study of Food Proteins; Protein Interactions in Emulsions: Protein-Lipid Interactions; Protein Interactions in Foams - Protein-Gas Phase Interactions; Protein Interactions in Gels - Protein-Protein Interactions; Protein-Polysaccharide Interactions; Chemical and Enzymatic Modification of Proteins for Improved Functionality; Functionality of Soy Proteins; Whey Protein Functionality; Color as a Functional Property of Proteins; Protein Gel Ultrastructure and Functionality; Proteins as Fat Substitutes; Edible Films and Coatings from Proteins.